Posture refers to the way you hold your body when sitting, standing, laying, and walking. Good posture helps prevent excessive strain on the joints and muscles of your body, which helps to reduce pain and minimize your risk of injury. Good posture can even boost your self- esteem and mood. While it takes time and effort to train your body to maintain good posture, the health benefits are definitely worth it! Let’s first discuss the anatomy of your spine. Your spine is comprised of three natural curves that need to be aligned correctly so that the weight of your body is evenly distributed over both of your feet. Cervical curve – a slightly forward curve of your neck. Thoracic curve – a slightly backward curve of your upper and mid back. Lumbar curve – a slightly forward curve of your lower back. Your chin parallel to the floor. Your shoulders back and even. Your spine in a neutral position, with no excessive arching of your back. Your arms hanging loosely at your sides. Your core muscles gently engaged. Your knees even and pointing forward. Your body weight evenly distributed over both of your feet. In a seated position, your chin should be parallel to the floor, with your shoulders, hips and knees even, and your knees and feet pointing forward. Encourages proper alignment of joints and bones. Promotes effective and efficient use of the muscles of your body. Reduces abnormal wear and tear on joint surfaces. Decreases stress on the ligaments of your spine. Prevents abnormal positioning of your spine. Decreases the risk of strain and sprain injuries. Decreases the risk of back pain. Unfortunately, good posture can be a challenge to maintain. Humans weren’t designed to sit in chairs or hold prolonged postures. We are designed to move! There are a number of factors responsible for poor posture; the most common factors that lead to poor posture include a sedentary lifestyle, obesity, stress, weak or tightened muscles, and pregnancy. You can improve your posture by performing certain core strength and flexibility exercises, particularly for your chest and hip muscles. It’s important to be conscious of your posture while you exercise, which may mean checking your position in the mirror or having a qualified Physical Therapist monitor your exercise program. The good news is that once you start increasing your core strength and overall flexibility, you’ll start to notice improvements in your posture in a few short weeks. Being mindful of your posture during the day, especially when sitting at your desk. Try things like using external reminders to check your posture such as whenever a phone rings, or an email notification comes up. Having an ergonomically friendly workstation. A sit to stand desk can make posture changes easier and change the prolonged loads your body experiences when you have only one predominant position like sitting. Get regular cardiovascular and resistance exercise to keep your muscles supple, your joints supported and your bones strong. Get some help from the professionals when you can: Physiotherapy and Massage Therapy make a great combination approach to strengthening weak muscles and lengthening short muscles. Remember, gravity is always working against you so frequently changing postures is key to prevent muscle fatigue or even more permanent changes to your spine. The BEST posture if often the NEXT posture! Your goal is to spend more time in an optimal position that a dysfunctional one, but even the perfect posture will be tiring over time so wriggle, shift, get up and walk around, stretch, and move every 30 minutes if you can. If you’re looking to improve your posture, you may benefit from Physical Therapy, which will involve an individualized treatment plan that is tailored specifically to your postural issues. You will work with your Physical Therapist to set goals and track your progress as you work through your treatment plan. Undergoing a Physical Therapy assessment is one of the best ways to ensure you have good posture. After the assessment, our Physical Therapists will create a program that is specific to your needs, and set you on the right path toward optimal posture. Massage Therapy is also a key team member in maintaining good posture and healthy tissues. They are experts in finding those shortened or tight bands of muscle that aren’t letting you move well. A proper course of treatment can really make your muscles more limber and ready for strength training, and keep a lot of muscle pain to at bay! 1. Kumar, B. Poor posture and its causes. Int Journal of Physical Education and Health. 2016; 3(1): 177-178. 2. Posture: Align yourself for good health. Mayo Clinic. https://www.mayoclinic.org/healthy-lifestyle/adult-health/in-depth/posture-align-yourself-for-good-health/art-20269950. Published 2019. Accessed February 17, 2019. 3. Posture. Acatoday.org. https://acatoday.org/content/posture-power-how-to-correct-your-body-alignment. Published 2018. Accessed February 17, 2019. 4. How To Improve Posture For A Healthy Back - Good Posture | Cleveland Clinic. Cleveland Clinic. 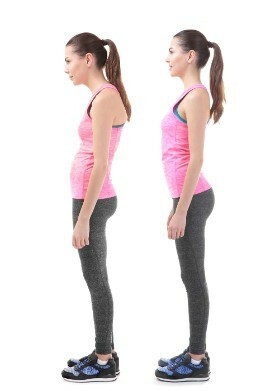 https://my.clevelandclinic.org/health/articles/4485-back-health--posture. Published 2019. Accessed February 17, 2019. 5. Why good posture matters - Harvard Health. Harvard Health. https://www.health.harvard.edu/staying-healthy/why-good-posture-matters. Published 2019. Accessed February 17, 2019. 6. Kim D, Cho M, Park Y, Yang Y. Effect of an exercise program for posture correction on musculoskeletal pain. J Phys Ther Sci. 2015;27(6):1791-1794. doi:10.1589/jpts.27.1791.